Hi, I tried to enter cheat codes in Midnight Club 3: DUB Edition Remix and it says invalid code. I believe Enable Cheats are on. I have PCSX2 1.0.0. Maybe target cheat addresses have changed because of undub. If ordinary (for no undub) cheats don't work, you have to find them anywhere for the undub version or by yourself using a cheat tool like Cheat Engine. (10-19-2013, 04:44 PM)tadatada Wrote: Maybe target cheat addresses have changed because of undub. As for OP, paste your cheats mate, we'll see what's wrong with them. allin - Unlocks Zone special move. crosscountry - Unlocks all cities in arcade mode. dfens - Unlocks Argo special move. getheadj - Unlocks Yellow Smiley Face. getheadk - Unlocks Pumpkin Head. getheadl - Unlocks Bunny Head. getheadm - Unlocks Snowman Head. getheadn - Unlocks Skull Head. haveyouseenthisboy - Unlocks Chrome Body. hyperagro - Increases your car’s mass in arcade mode. kubmir - Adds a dollar to your career money total. ontheroad - Allows your car to receive no damage. rimbuk - Subtracts a dollar from your career money total. roadtrip - Unlocks all cities in arcade mode. ro4r - Unlocks the Roar special move. trythisathome - Unlocks Flaming Head. urbansprawl - Makes pedestrians faster. None of them works in the cheats menu of the game. 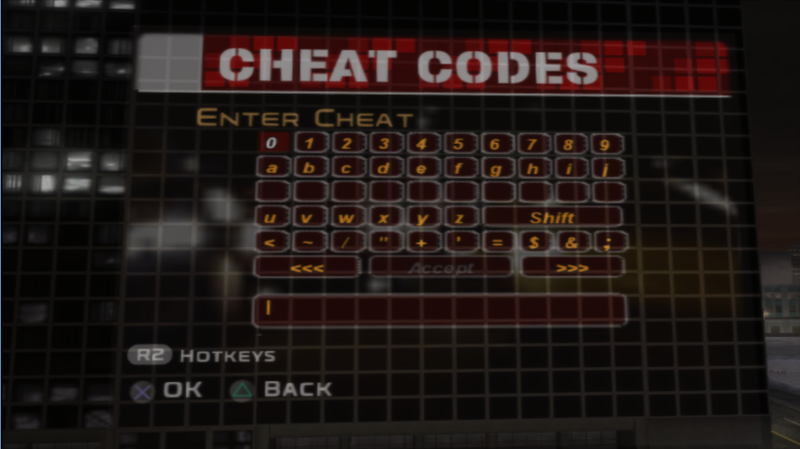 Never saw this method of cheating (like console cheat in PC games) in a PS2 game, what is for sure it is not something depending on the cheat option status, I mean that will not do any difference if cheats are toggled on/off in this case. Still nice report that may help developers to find out how and why the cheats are not being recognized, one possibility is related to characters encoding. Anyway it has nothing to do with PCSX2 cheat engine, about this you may rest assured that's nothing you are doing wrong, the bad notice is there is nothing a user can do to help also. Edit: Tell us, are the cheats actually inputted as text on a console or chosen/selected (clicked) in an options menu? Sorry for the super late reply. I was busy, very busy. Yes, it is in an options menu. I can confirm this too as i owned this game when i had a working ps2 and i've tried to enter cheats in pcsx2 and it doesn't work. Possibly a character encoding issue. There are also numerous graphical glitches in this game that may or may not have been fixed in the recent git builds. And i was wrong they haven't been fixed either. Although the cheats do work now in the latest git build.